When the nights are drawing in and weather is starting to get chilly, what could be more welcome than a brief fantasy trip to the balmy Caribbean. 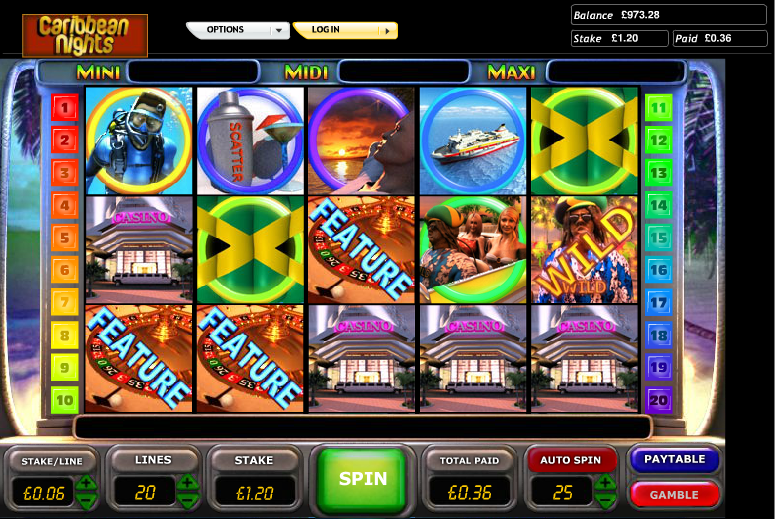 This experience can be all yours if you check out this cheery and colourful online slot from Openbet. It’s called Caribbean Nights and it’s progressive jackpot is a welcome tonic on those cold northern European evenings. 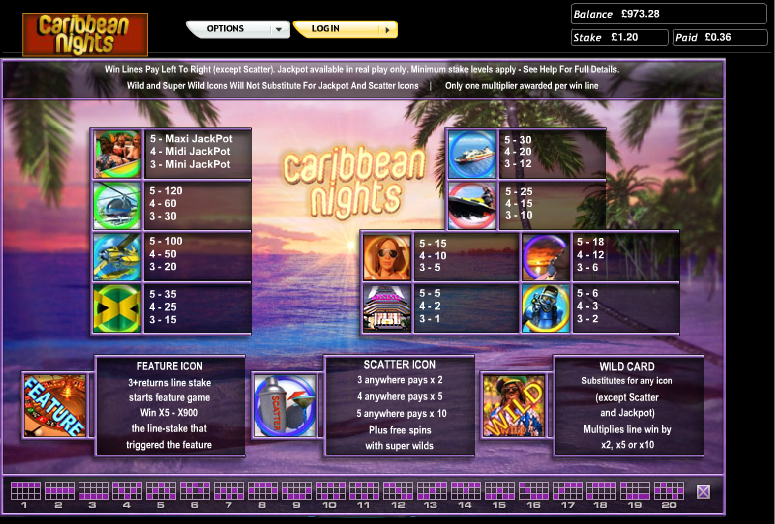 Caribbean Nights plays out over five reels and up to twenty paylines and it’s no surprise that the backdrop to the reels is a palm-fringed beach – just visible either side of those reels. The various symbols looks as though they are part of a marketing campaign for this particular island and include a scuba diver, a casino, a sunset, a female tourist, a rigid inflatable, a yacht, the Jamaican flag, a seaplane and a helicopter. There’s also a carload of people and this symbol is the key to the progressive jackpot. The scatter is a cocktail shaker, the bonus symbol is a roulette wheel and the wild is a Rastafarian chap. Landing three of the cocktail shaker scatter symbols anywhere on the reels will trigger this feature. As you can see from the video above, you first need to select from the boxes shown to determine the number spins awarded. When you find ‘Launch’ the spins will start. Super Wild icons replace the standard wilds here and when these land they have a number attached; that’s the number of spins they will remain in place for. If you land three more scatters during this feature, the spins will be paused and you will begin the process again with the new number of spins adding to your total. Trigger this mini-game by landing three, four or five of the roulette wheel symbol from left to right from reel one. You will now get the chance to play three spins on a mini-roulette table and your betting total will 5x, 10x or 15x your line stake depending on how many symbols triggered the game. You can use all your chips in one spin or spread them out over three spins so good luck! All wins can be gambled by clicking the ‘Gamble’ button underneath the reels. You can try to double or quadruple your win by correctly predicting whether the next card revealed will be red, black or the correct suit. The can see the Mini, Midi and Maxi jackpot totals above the reels and these are won by landing three, four or five of the car symbols on a winning payline. If you want to win the progressive jackpot, you’ll give yourself a better chance of doing so by playing maximum paylines. Play the gamble feature only occasionally – it’s the quick way to deplete your bankroll. There’s loads going on in this game and it’s certainly fun to play, even if looks a bit untidy. There’s also a steel band accompaniment to your gameplay. Well worth checking out.